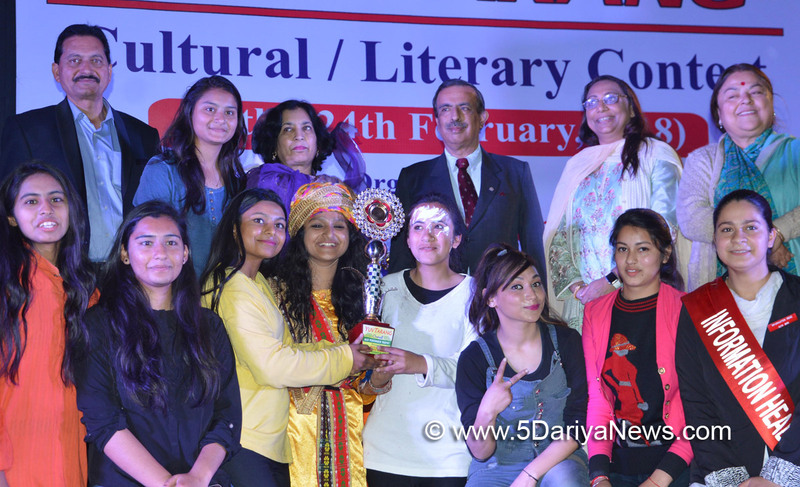 Advisor to Chief Minister, Prof. Amitabh Mattoo today said that the cultural and sports activities play an important role in the holistic development of youth.Prof Mattoo was speaking during the valedictory function of cultural and literary contest, YUVTARANG 2018 organized by Dean Students Welfare, Cluster University of Jammu.In the event, students hailing from five constituent colleges of Cluster University Jammu including GCW Gandhi Nagar, Govt. MAM College, Govt. SPMR College of Commerce, Govt. College of Education Jammu and GGM Science College participated in different events viz. dance, music, creative arts, theatre and literary activities.Vice Chancellor Cluster University of Jammu Prof. Anju Bhasin, Registrar University of Jammu, Indu Kilam, Dean Academic Affairs Cluster University of Jammu, Prof. Poonam Dhawa, Controller Examination, Cluster University of Jammu, Z.A Hashmi, Principals of colleges, Professors and other senior officers were present on the occasion.Speaking on the occasion, Prof Amitabh Matoo complimented VC and other organizers for holding such colourful and creative events. He said such events are pivotal for the overall development of students as they inculcate affection towards the roots.VC Cluster University of Jammu, in her address, said that comprehensive and vigorous efforts are being done to provide excellent and sophisticated environment to the students.“The priority of the institution is overall development of the students,” she said, adding the University would also hold Sports festival soon.Later, Prof. Mattoo distributed trophies and testimonials among the student who participated in different activities during the cultural and literary contest.